Fangirls – Press Kit – WHAT THE FORCE? An 8 part monthly Audio Drama about five Fangirls taking a roadtrip to see a secret screening of Episode IX. After a disappointing date with a male Star Wars fan, Ally and her fellow Fangirls, Kristy, Rish, Dani and Lexy find out about a secret screening of Episode IX in 3 days time. They decide to embark on a crazy road trip to attempt to see the movie before anyone else… but most importantly together. 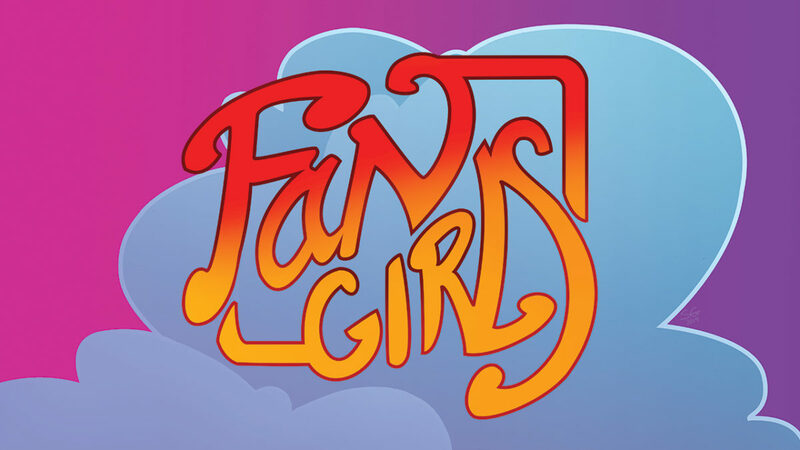 Fangirls is an 8 Part Audio drama release monthly about Fangirls in the Star Wars Fandom. It’s about Girls, Relationships and about what they all love… Star Wars. We love our talented and capable cast and crew. We’ve created a separate page for each of them and given them all an opportunity to let you know how to get in touch with them and share in the other amazing projects they’ve done to date. You can find the list of them all right here and I’d be remiss if I didn’t thank them again for all of their hardwork and timely effort. Available at Stitcher, Google Play, iTunes and Spotify. Also Available on YouTube. Over the Past year especially I have seen an amazing amount of Female Star Wars fans stand up and scream proudly to the heavens that they are indeed Star Wars Fans. The Fangirls of Star Wars have always existed – look at the amazing work from Looking for Leia – but for some reason this part of the fandom is ignored or not celebrated for the amazing positive and creative space it is. One day, on a female only Star Wars group on Facebook (The Galactic Fempire), someone asked what everyone’s experience watching Fanboys was like; hilarious, sad, and happy stories ensued, from women being gatekept from Star Wars Fandom to enjoying the movie and the fandom of the time. One such experience was shared by my now online friend Allysha whose experience of Fanboys was as part of a terrible date. It inspired the first scene in Fangirls and for me to ask the question what would I do to see Episode IX right now? If I had the chance? The rest of the story fell out of me from there, inspired by the amazing writers I have spoken to over the past year, my love of Asian Dramas and the Fangirls I know and love so much. I like that it feels like it could happen, I know so many women and Fangirls that would drop anything they were doing to seen this concluding movie. We don’t talk about that in the media though… Why? I think its a more clickable story to focus on the negatives of Fandom, just look at all of the Star Wars YouTube that are click factories collecting Negitivity. If you have a positive message or at least focused on celebrating what you love it doesn’t get shared. But fiction.. story making something into a relatable, hopefully entertaining story can help redeem people from the negativity Dark side. Also, WHY NOT? I can write what ever I like and if people want to listen – Cool. I’m giving it away. Who would you most want to listen? Your movie The Last Jedi inspired me, a long time fan, to start my own fan podcast because I saw a movie that was talking directly to me as a female fan. My voice, my thoughts had value. My experience is not in exclusion. So on behalf of all the Fangirls that don’t have the ability to thank you directly: THANK YOU. This story is the story of the fandom you helped along on it’s own Heroine’s Journey, we will always love you for that. Please DM me on Twitter @wtforceshow, I have a question for you. I’m being serious, Rian please do it right now. Thank you. But beyond Rian, I’d love for every fan of Star Wars to listen in on the adventures of these Fangirls. I want young women, just experiencing Star Wars for the first time, to see the joy the Wars brings to people and the bonds that form from the mutual love of a creative endeavor like Star Wars. I wrote this sucker, with inspiration, cajoling, encouragement, and support from those around me but this only became a reality when my husband Kyle Gould (an Audio Drama Actor) decided to surprise me with a plan to produce it. Time, money, coordination and effort all go into producing one of these things and Kyle made it a reality. Kristina Manente is our amazing audio engineer who is not only the SFX team, but the editor, she paints the picture with the audio design and timing – also she is a genius. Christy Carew who is my amazing composer friend (Sundance Film Lab Fellowship recipient) composed the original soundtrack for the show. Christy is brilliant and a joy to get to work with. Amy Wishman Nalan is our production assistant – who was brought on at the last second to make words sound good for the masses and handle our social media. With this crew we have an amazing cast of people who are all a joy to work with (HERE). You are in luck! We are also producing a follow up show called Fangirling which will post two weeks after each episode is released to General audiences and Patreon. Hosted by the amazing Natasha Fox, Fangirling will cover behind the scenes of each episode with cast and crew of Fangirls and will talk about Fandom and give people a chance to Fangirl about Fangirls. What is this thing? And where can I find it? An Audio Drama is like an old time radio play – it is an art form of its own and comes with its own challenges – like how do you have a make-out session in an audio drama? I figured it out don’t worry. Fangirls will be released in 8 parts to general audiences on the last Thursday of every month from March onwards on its own RSS feed and on the What the Force? YouTube channel. Also see the summary for plot details. Transcripts will also go up live on the site the day of the wide release.